Experts and eyewitnesses from across the country gather in Southern California to discuss the biological implications of aerosol operations being conducted on a global scale. A growing number of sky watchers have discovered that aerial spraying is being conducted upon the public without their consent. 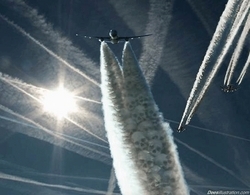 Researchers are learning that these operations, which produce Chemtrails, are dramatically altering the nature of the atmosphere and our health in ways that threaten our very existence upon this planet. The U.S. Air Force calls such a theory a "hoax" and explains away the phenomenon as contrails. But analysis of the trails left behind by certain jet aircraft reveal that they are composed of harmful chemicals, and are being deliberately produced and covered up by the government. While Chemtrails may look like contrails initially, they are much thicker, extend across the sky and are in patterns of Xs, tic-tac-toe grids, cross-hatched and parallel lines. These patterns open into wispy formations which join together, forming a canopy of haze or thin white veil that persists for hours. Witnesses have noticed planes intensively laying down broad white plumes over every major city and rural area in the United States and Canada since 1998. They have also been seen in Europe, Australia, Mexico, Bahamas, Brazil, Croatia, and Puerto Rico. Why should you be concerned about Chemtrails? Researchers believe possible uses for such an operation could include weather modification, bio-warfare or massive scale population reduction. Symptoms from exposure include; upper respiratory and intestinal distress, pneumonia, extreme fatigue, splitting headaches, aching joints and muscles, depression and other health related issues. Clifford Carnicom and Dr. Gwen Scott, ND will present to the public the latest information on disturbing biological findings at the California Chemtrail Convergence on Saturday, May 17th at the Immanuel Presbyterian Church* located at 3300 Wilshire Blvd. in Los Angeles. Seating begins at 4:00 PM. In an attempt to build networks of support, the public is also invited to bring photos from their communities to share with others. To see why this is such an important issue, please watch this short video clip. For more information on the California Chemtrail Convergence call 805-653-1588 or visit GoodKarmaPR.com for pre-sale tickets. Clifford Carnicom has been an independent researcher on the aerosol operations (aka Chemtrails) for the past nine years. His work examines a broad range of applications including environmental control, military, electromagnetic, surveillance and geophysical applications, biological operations and geophysical considerations. He has produced an award-winning, non-profit documentary on the aerosol issue that is distributed worldwide. Currently a computer consultant, Clifford was a research scientist and federal employee for 15 years with three different agencies, including the U.S. Department of Defense. He has held a high level security clearance. His research can be found at Carnicom.com. Dr. Gwen Scott, ND is a Naturopathic Doctor and Former CNN News Anchor. She is a Master Herbalist and has studied with the prominent alternative medicine practitioner, Dr. Deepak Chopra. She has also studied with traditional healers in the Latino/Hispanic and Native American communities. Currently Dr. Scott writes a natural health column for Prime Time New Mexico as well as giving speeches and seminars to community groups, hospitals and schools on natural medicine. The California Chemtrail Convergence is sponsored by Good Karma Public Relations, Carnicom.com, The Right to Breathe Healthy Air, LosAngelesSkywatch, ArizonaSkywatch, NewYorkSkywatch , BakersfieldSkywatch, OregonSkywatch , Wisconsin Chemtrail Report and ContrailsMyAss.com. *The views expressed in this press release are not necessarily those of Immanuel Presbyterian Church.